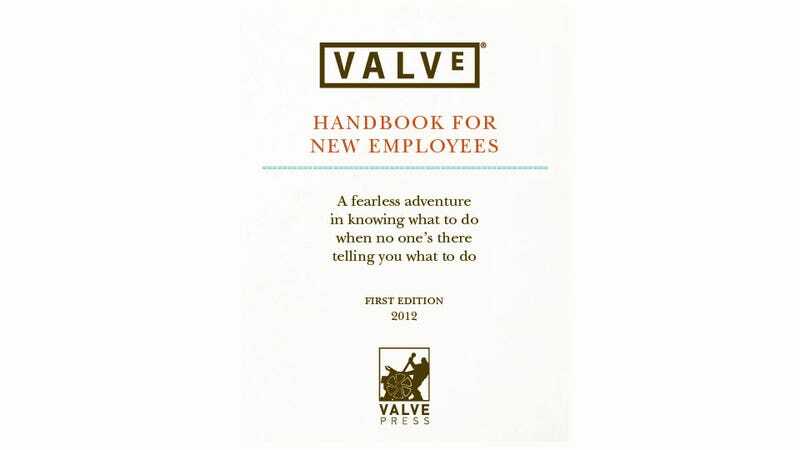 On Friday, a user on the Flamehaus forums uploaded a very convincing pdf, complete with accompanying photo, of a new book called Valve: Handbook For New Employees. Joining the pdf is an apparent email from Valve's Greg Coomer, saying it was written to "make it as easy as we could for new people to join the company". If you have any interest in Valve as a company at all - and as not only the developers of the Half-Life and Portal series but the overlords of digital shopfront Steam, you probably should - it's a must-read. The company has a reputation as a workplace unlike many others in this business, and if this thing is real, it's a reputation well-deserved. It also has a reputation as being home to some genuinely funny human beings. Again, if this thing is real, it's a reputation well-deserved. Come for the illuminating text. Stay for the awesome illustrations! You can read the entire thing in the embedded window below (or for more optimal viewing click on the little black arrow saying "open in new window"). We've contacted Valve for confirmation of the book's authenticity, and will update if we hear back. UPDATE - The handbook is indeed official, and is now available for viewing on Valve's website.